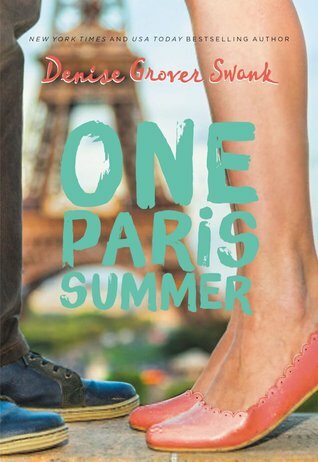 One Paris Summer is a delightful read full of teen angst, love, heartbreak, and revelations. Denise Grover Swank does a phenomenal job of show how tragedy and heartbreak can take a toll on a person; that when a person leaves you it has lasting effects on your life; that by forgiving them can you then move forward. Sophie Brooks is forced to spend the summer before her Junior year in Paris. She is forced to live with her father who abandoned Sophie and her brother, Eric, in pursuit of his dream to restore an old Parisian church. She is forced to get to know a new step-mother, and, share a room with an evil step-sister, Camille. But as the summer progresses Sophie is faced with obstacles and has to decide if she can forgive the people who hurt her, and if she can make her dreams come true. From the start of the novel, the teen angst and anger is at 200%. Sophie and Eric have a difficult time handling the abandonment of their father. They also have a difficult time understanding how their father can marry someone else so quickly, someone else they have never met. It doesn’t have that their father hasn’t talked to them in 10 months. Sophie stews on things in her mind and that gave me anxiety. But I can also related to who she is feeling. To have your whole word ripped apart is devastating and learning how to handle that is overwhelming. So while it did get annoying that Sophie stewed a lot, I understand and could move past it. Her step-sister Camille on the other hand I wanted to punch in the face. She is rude and inconsiderate from the moment she meets Sophie. She is always trying to humiliate her in an attempt to get to go home- back to South Carolina. And it doesn’t help that she ropes her friends into this plot as well. However, there is a bright spot… or two bright spots as the book moves forward. Her brother, who has shown very little interest in her life, starts to take an active role in their Paris excursions. He stands up for when it is needed and can empathize with the hurt of their father. The other bright spot is Matthieu. He opens her eyes to dreams she didn’t think possible. He is truly a great guy for her. However, as always, there are secrets and heartbreak. But as with any good YA Contemporary novel… it only lasts for a little while. Swank’s summer through Paris is wonderful. Not only do we see Sophie’s character arc and growth, but we see secondary character’s growth as well, showing that everyone at any age can learn new things about themselves and others. Acceptance is the big theme throughout the book. I’d like to thank NetGalley and Zonderkidz-Books for the chance to read this ARC. Receiving this ARC for free does not influence my review in anyway.